A few news items today on Matsuzaka's future. The other interesting note, and something that I've been following since the WBC, is that the Yomiuri Giants are trying to blow Seung Yeop Lee away with a big three year offer to keep him in Japan. He is hitting .326 with 36 homers and 81 RBIs for the Giants this year and is the only real bright spot in their everyday lineup. If they can't re-sign him, which the Japan Times says is only a 10% chance, the 'Kyojin' fans will have more to be depressed about than their 2006 last place finish. 90% Lee is in the Majors next year. The second article was from the Seattle Times' Steve Kelley. Most of the piece is dedicated to blowing up the team. He even gets on Ichiro for hitting .325, but only producing singles. It's rough going in Sea-Town these days that anyone could find fault with Ichiro. He wants the team to make the $30 million splash to bring in Matsuzaka, AND sign Jason Schmidt. Yeah. Good luck with that one Steve. "Daisuke Matsuzaka, Seibu Lions, right-handed pitcher: It's undecided whether the Lions will post -- auction off the negotiating rights for -- Matsuzaka, the 25-year-old pitching sensation who was the Most Valuable Player of March's inaugural World Baseball Classic. If he is posted, it could cost $30 million -- and that's before negotiating a salary with him. Orioles' angle: They have yet to jump into the Asian market, so don't count on it." The last thing I wanted to report today is only marginally related to Matsuzaka, but is a follow up to the piece I wrote yesterday about Pitcher Abuse Points. The Final game at the Koshien Summer High School Baseball Tournament was held today. The game ended in a 1-1 tie after 15 innings, which requires that both teams return the next day to start from scratch. Yup. Play it again. 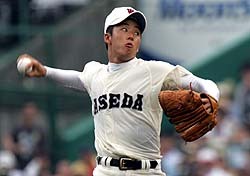 The thing is, Oh Sadaharu's alma mater Waseda Jitsugyo featured their ace, Yuki Saito, who showed great stuff going all 15 innings with 178 pitches. The defending champions from Hokkaido, Komadai Tomakomai, also got a great effort from their top pitcher, Tanaka, who went from the 3rd inning to the end of the 15th on 165 pitches. Watch them go again tomorrow. Why not? 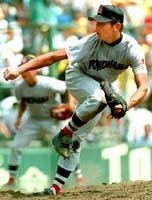 Saito threw 178 pitches after pitching 5 complete games in 9 days. Why not? What's 700-800 pitches in 9 days among friends. The Japanese consider it heroic and powerful. I call it torture and it should stop immediately. Just prehistorically stupid. Get out of the Meiji Era, Japan. This is a world of science and advanced sports medicine. Stop the madness.